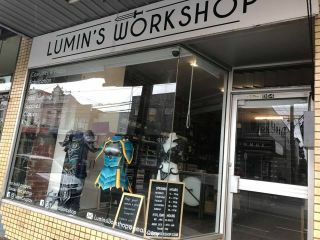 Lumin's Workshop is both a shop for cosplay supplies and a hub for a community. Cosplayer Maggie Hu runs Lumin's Workshop out of a former pie store. "There's still an actual bakehouse back there," she says, nodding at the storage area behind the store. Today Lumin's Workshop sells cosplay supplies rather than baked goods, with shelves of prop-making foam, clay, and thermoplastic alongside paint, glue, dye, LEDs, and books about every aspect of the hobby. But it's also a space for cosplayers to learn and to practice. The stock takes up the edges of the store, while the centrepiece is a table for people to work at. "On weekends we do workshops," Hu explains, "and we've started doing more social events. Craft parties, where people come in and craft together. But those things have outgrown the space, so we're planning on moving our craft parties to other premises." During the week Lumin's Workshop is only open for a couple of hours on certain days, and it sees a steady stream of customers. On their way home from work people stop by to pick up some supplies for their next project, or ask for advice on how to get started. The workshop provides the kind of communal shared knowledge Hu didn't have access too when she was getting into cosplay in small-town Australia. She had to learn by trial and error. "My first cosplay was a really, really terrible Bandos armor from Runescape," she says. "This was before I realized there were cosplay-specific materials and I made it out of fibreglass, air-drying clay, and cardboard. So bad! It's really, really terrible. Just the couple of pieces, it was 15 kilos." To get hold of material designed for cosplay, Hu had to import it from overseas. It was so expensive she ended up buying in bulk to save money, selling what she didn't use to her friends. They passed on the word, and soon she found herself in the odd position of being a kind of imported foam dealer. "I had so many people who I didn't know in the cosplay community being like, 'Hey, do you have more of that stuff?' I'm like, 'No, I sold it all to my friends already.' From there it just grew. I used to sell it out of my apartment and I had it in my sister's wardrobe." Though she was studying architecture at the time, when Hu saw an opportunity to turn her passion into a paying career she jumped at it. Now, instead of her sister's wardrobe, she has a warehouse half an hour away from the workshop. "We import stuff by the container," she says, "and any of our own branded stuff is produced by us, a lot of it is our formula." One of Hu's more recent efforts, Diablo 3's Wizard. Photo by SnaphappyIan. That includes Lumin's Foam Clay, which other cosplayers I've spoken to use in crafting their props. It's based on a product for kids but with tweaks to the recipe that make it better for modelling things like armor—and it weighs a lot less than fibreglass. "I don't know if you've ever heard of Crayola Model Magic," Hu explains, "it's this brittle kid's clay stuff that we've just improved for cosplayers by making it dry more flexible, and sandable. Crayola Model Magic, you can't sand it." Cosplayers have been finding inventive ways to repurpose existing things for years, but having the luxury of dedicated products like these makes even more impressive creations possible. As Hu says, "Floor mat is fantastic but at the end of the day it's designed to be floor mat." After giving up on fibreglass but before discovering foam clay, Hu used a thermoplastic called Worbla, which can be shaped when it's heated. It's still pretty heavy, especially when you're using enough of it to make a full suit of Lich King armor, which is what she did. "The hardest thing was those enormous videogame shoulders," she says. "It was attached to the front but at the back there was a big steel bar that actually connected them together. Wouldn't do that again, but it worked at the time." The advantage of having essentially an axle connecting the shoulders together is that they rose together, and she was in no danger of bashing her head any time she raised an arm, which surely must be a problem for your actual Lich King. In terms of practicality, Hu's a fan of Monster Hunter's armor. "My favorite thing about Monster Hunter armor is that whoever designed them really thought about how they would sit on a real person," she says. "You don't have things phasing through each other. Love that about Monster Hunter armor." The heroes of Monster Hunter carry over-sized weapons and look dramatic, something they have in common with Blizzard characters. (Hu also cosplayed Diablo 3's wizard as part of a blood drive at PAX Australia). They're designs that stand out across the crowded floor of a convention. As for why she gravitates toward them, Hu's explanation is simple. "I'm quite a short, small person," she says, "and I like to be tall and imposing-looking."